Published Jun 25, 2015 by Que. Part of the LiveLessons series. 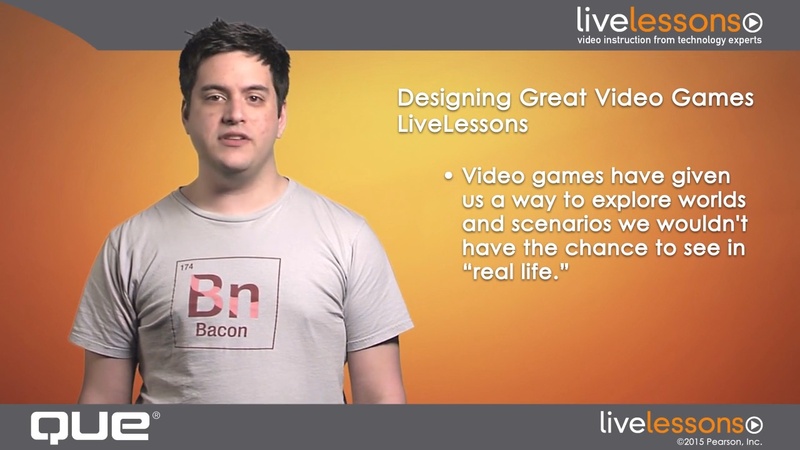 Learn how to design video games that are brilliantly playable and endlessly fun! Become an expert in video game theory in just 6 hours of incredibly easy video--just watch! Build video games that are always exciting, never boring…always fresh, never copycat…always fun, offering just the right amount of challenge! This six-hour video course will teach you the key skills of video game theory, so you can deliver truly great games for any platform--mobile, console, or computer. Using new examples and best-in-class in-game footage, Zach Comm shows you the difference between “meh” games and truly unforgettable video game experiences. You’ll learn how to borrow from formulas without letting them trap you…build games that are endlessly replayable…challenge players without overwhelming them…support complexity…learn from experience…determine whose feedback is worth listening to…understand the many forms of high- and low-intensity fun and deliver them! 1.1 What Is a Great Video Game? 5: The Crux of Creation - Fun!